The following is news release from NASA. A combination of extreme cold temperatures, man-made chemicals and a stagnant atmosphere were behind what became known as the Arctic ozone hole of 2011, a new NASA study finds. Even when both poles of the planet undergo ozone losses during the winter, the Arctic's ozone depletion tends to be milder and shorter-lived than the Antarctic's. This is because the three key ingredients needed for ozone-destroying chemical reactions —chlorine from man-made chlorofluorocarbons (CFCs), frigid temperatures and sunlight— are not usually present in the Arctic at the same time: the northernmost latitudes are generally not cold enough when the sun reappears in the sky in early spring. Still, in 2011, ozone concentrations in the Arctic atmosphere were about 20 percent lower than its late winter average. The new study shows that, while chlorine in the Arctic stratosphere was the ultimate culprit of the severe ozone loss of winter of 2011, unusually cold and persistent temperatures also spurred ozone destruction. Furthermore, uncommon atmospheric conditions blocked wind-driven transport of ozone from the tropics, halting the seasonal ozone resupply until April. "You can safely say that 2011 was very atypical: In over 30 years of satellite records, we hadn't seen any time where it was this cold for this long," said Susan E. Strahan, an atmospheric scientist at NASA Goddard Space Flight Center in Greenbelt, Md., and main author of the new paper, which was recently published in the Journal of Geophysical Research-Atmospheres. "Arctic ozone levels were possibly the lowest ever recorded, but they were still significantly higher than the Antarctic's," Strahan said. " There was about half as much ozone loss as in the Antarctic and the ozone levels remained well above 220 Dobson units, which is the threshold for calling the ozone loss a 'hole' in the Antarctic – so the Arctic ozone loss of 2011 didn't constitute an ozone hole." The majority of ozone depletion in the Arctic happens inside the so-called polar vortex: a region of fast-blowing circular winds that intensify in the fall and isolate the air mass within the vortex, keeping it very cold. Most years, atmospheric waves knock the vortex to lower latitudes in later winter, where it breaks up. In comparison, the Antarctic vortex is very stable and lasts until the middle of spring. But in 2011, an unusually quiescent atmosphere allowed the Arctic vortex to remain strong for four months, maintaining frigid temperatures even after the sun reappeared in March and promoting the chemical processes that deplete ozone. Maps of ozone concentrations over the Arctic come from the Ozone Monitoring Instrument (OMI) on NASA's Aura satellite. The left image shows March 19, 2010, and the right shows the same date in 2011. March 2010 had relatively high ozone, while March 2011 has low levels. The vortex also played another role in the record ozone low. "Most ozone found in the Arctic is produced in the tropics and is transported to the Arctic," Strahan said. "But if you have a strong vortex, it's like locking the door -- the ozone can't get in." To determine whether the mix of man-made chemicals and extreme cold or the unusually stagnant atmospheric conditions was primarily responsible for the low ozone levels observed, Strahan and her collaborators used an atmospheric chemistry and transport model (CTM) called the Global Modeling Initiative (GMI) CTM. The team ran two simulations: one that included the chemical reactions that occur on polar stratospheric clouds, the tiny ice particles that only form inside the vortex when it's very cold, and one without. They then compared their results to real ozone observations from NASA's Aura satellite. The results from the first simulation reproduced the real ozone levels very closely, but the second simulation showed that, even if chlorine pollution hadn't been present, ozone levels would still have been low due to lack of transport from the tropics. Strahan's team calculated that the combination of chlorine pollution and extreme cold temperatures were responsible for two thirds of the ozone loss, while the remaining third was due to the atypical atmospheric conditions that blocked ozone resupply. 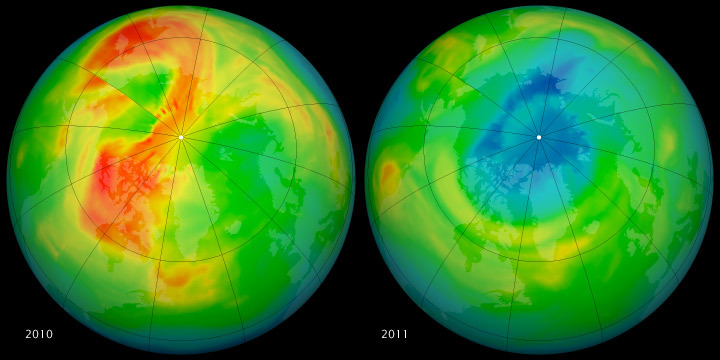 Once the vortex broke down and transport from the tropics resumed, the ozone concentrations rose quickly and reached normal levels in April 2011. Strahan, who now wants to use the GMI model to study the behavior of the ozone layer at both poles during the past three decades, doesn't think it's likely there will be frequent large ozone losses in the Arctic in the future. "It was meteorologically a very unusual year, and similar conditions might not happen again for 30 years," Strahan said. "Also, chlorine levels are going down in the atmosphere because we've stopped producing a lot of CFCs as a result of the Montreal Protocol. If 30 years from now we had the same meteorological conditions again, there would actually be less chlorine in the atmosphere, so the ozone depletion probably wouldn't be as severe." NASA Goddard Space Flight Center,Greenbelt, Md.